Olivia shared this note from her 8-year-old daughter, Teagan. Tonight I had to run by the grocery store to pick up a prescription. Two kids in tow, I sent them to go pick out some Jell-o or pudding (they didn’t even have to agree on a flavor). They thought I was the coolest mom ever; I was just happy to not have them in the pharmacy line with me. My son, who’s 7, returned with the adult version of pudding: dark chocolate, three layers, and a something that was supposed to look like raspberries. My daughter, who’s 8, came back with lemon-lime Jell-o. Sugar free. In other words, about as tempting as the open-backed gown and hospital bed that usually accompany such a treat. We can only assume that the three-layer, dark chocolate pudding – which did not have a sticky note disclaimer – was fair game. So what are you waiting for? Submit today! 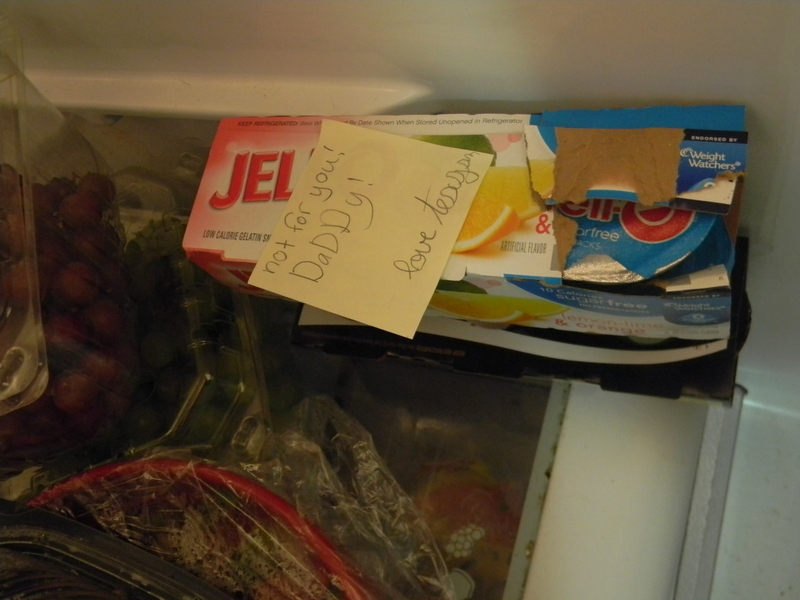 Posted on October 20, 2011, in For Dads, Notes, Writing in Weird Places and tagged children writing, funny, hand-written notes, Humor, Jell-o, kid writing, Notes in refrigerators, Writing. Bookmark the permalink. 11 Comments. My favorite part about this note is the fact that her signature is carefully crafted in cursive. She put in that extra effort to say HANDS OFF. She sent a message, for sure. In our house, a note would not deter the daddy-monster. In fact, hubby would probably get right in there, eat a few packs, then leave the child a “special” little snarky note of his own. Some back-and-forth with sticky notes in the fridge would be fun. I agree with Julie. It’s a nice touch that she put the effort into making sure daddy didn’t eat “her” Jello! If my other half saw that he would spitefully bake his specialty cookies and then put a note on them barring the kids from the entire plate. I could totally see that happening. Glad I’m not the only dad that would try to one-up the kids. Eww. I can’t stand Jello. If I have kids and they picked out that, they’d be welcome to it. The triple chocolate might disappear though, but it wouldn’t be from my husband who actually tends to dislike sweets. I guess they’ll have to leave notes to Daddy on their carrot sticks. This makes me laugh because it has happened to me more than once!